Open daily from Memorial Day Weekend through Labor Day Weekend, Monday - Saturday 10 to 5, Sundays, noon to 5. September hours are Thursday - Saturday 10 to 4, Sundays, noon to 4. The museum will close October 2nd for the season. Admission: $5.00/adult. $1.00/youth 5-18. $10.00/family (2 adults plus 2 children/grandchildren). Four and under are free. BVH members are free. The Old Chaffee County Courthouse, completed in 1882, now houses the Buena Vista Heritage Museum. Granite, Colorado, was the original site of the first courthouse when Chaffee County was split from Lake County in 1879. Buena Vistans voted to make their town the county seat, but Granite refused to give up the records. So a group of men lead by Ernest Wilbur "borrowed" a locomotive and flat car and went up to Granite late on the night of November 12, 1880. The men built a siding to the Granite Courthouse and kicked in the door. Sheriff John Mear and his wife investigated the noise and were forced at gunpoint to watch the removal of all the county records by the Buena Vista men. Furniture was unbolted from the floor, including the railing. Even the heat stove, with embers remaining in it from the day's use, was loaded onto the flatcar. There was no courthouse in Buena Vista at the time, so the records were stored in several business safes and in a stable until the new courthouse and jail complex were built. The cornerstone was laid on June 8, 1882 with full Masonic honors by Mayor Judson E. Cole. Governor Pitkin and Denver Mayor Morris attended the ceremony. 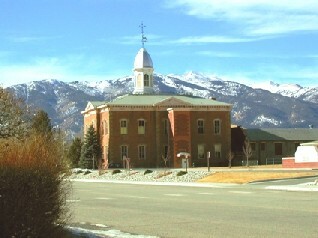 The Chaffee County Courthouse was used as a courthouse from 1882 to 1932. From 1936 through 1972 it was used as a school. In 1974, encouraged by tremendous public support, the School District sold the building to the Town of Buena Vista for $1.00. The building became the home of the Buena Vista Heritage Museum, the Chaffee County Council of the Arts gallery (now Arkansas Valley Art Center) and the Buena Vista Model Railroad Society display. In 2003, the Buena Vista population voted to sell the Courthouse to Buena Vista Heritage, also for $1.00. The Arkansas Valley Arts Center moved into the new Colorado Mountain College campus in the fall of 2005. The old county jail located to the rear of the courthouse is now used as the Buena Vista school administration building. The Fashions Room contains many interesting clothing items. Included are several wedding dresses, petticoats, undergarments, hats, shoes, men and children's clothing. Two rare examples of petticoats depict the lost art of "netting." A pair of boots were worn by Byrd Fuqua while helping rope a cougar in the 1920's. The black wedding dress belonged to Colorado Condrell Hewitt Waible and doubled as her "good" dress for special events. Family legend says that Colorado Deborah Condrell was born at sea on the U.S.S. Colorado en route to the United States. Her mother died shortly after her birth and the captain named the orphan after his ship. Colorado's wooden washing machine is also on display with several improvements in laundry techniques. The white dress and cape are unique. When Ione Hallock went on the "Grand Tour," her mother's wedding dress was cut up to make an evening dress for aboard ship. Ruffles off the dress were used to trim a soft blanket to use as a cloak to match the dress. In the Commerce and Industry Room, Stan Noga's magnificent collections of rocks, minerals and semiprecious gemstones are on display. Ledger books, assay equipment and samples from several of the local mines show the importance of mining to Buena Vista. The tourist and recreation industry is represented by the animal mounts throughout the room. Also on display are artifacts from other important industries in the Upper Arkansas Valley, including ranching, farming, and the military. A large oak cabinet and spittoons were original pieces used in the courthouse. The cabinet houses leather bound law books once owned by an early local attorney, George Hartenstein. The showcases have many miscellaneous items of interest including a list of the items in the school children's time capsule buried in front of the steps leading into the building. The Schoolroom is popular with both young and old because it has many pictures of Buena Vista's graduating classes and annuals. Examples of early school newspapers can be seen. Feel free to sit in the old wooden school desks and browse through the old Montgomery Ward catalogs and scrapbooks. The old raised maps in the wooden cabinet are of interest. The huge roll-top desk, no longer wanted by the owner, was saved from a trip to the dump. Early office equipment used in the courthouse is found in this room. The primitive examining table that was once owned by a local doctor and other medical items are located in this room. The hall has a variety of art work, an old telephone cabinet and two switchboards. It also includes a cell door from the jail. The large room at the top of the stairs was once the heart of this venerable old building. This courtroom was the scene of many exciting cases. The fate of Nicolo Ferminello, an Italian accused of stabbing a man to death, was decided here. He was sentenced to die for his crime and his is Chaffee County's only "legal" hanging. He was hanged at the back of the jail complex. The room, which is now available for rental, has the original judge's bench and chair. The superb, extensive historical model train display of the railroad system spanning 130 miles of the Upper Arkansas River Valley from Tennessee Pass above Leadville to Canon City's the Royal Gorge is also upstairs. It portrays the era (1880 - 1930) when mining and railroading were very popular in the area. A resource room is available to anyone researching local history. It is open during regular business hours, or by special appointment.